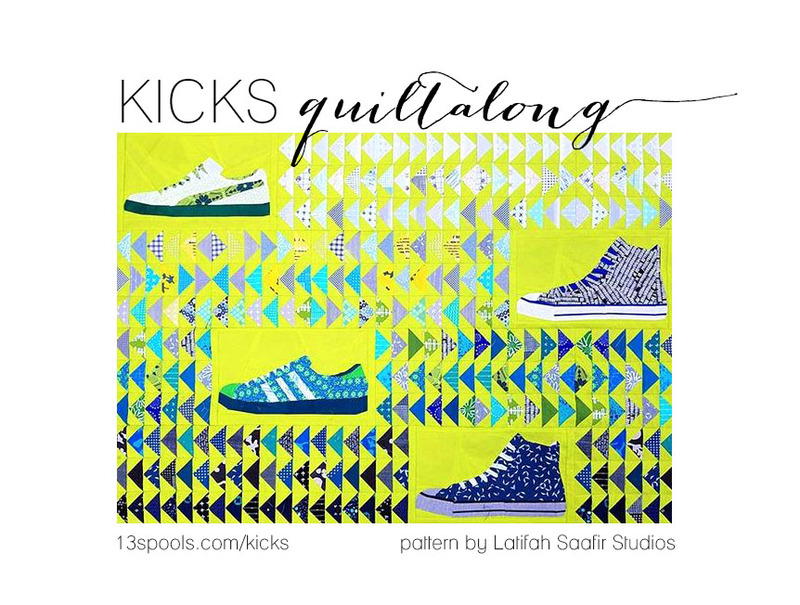 Last week, I announced on Instagram that I'm kicking off a quiltalong for Latifah Saafir's gorgeous Kicks quilt! Hopefully by now you have all gone and purchased your pattern from Latifah, or if you're just now hearing about this, go check out allllll of the details at www.13spools.com/kicks8u . I'm so excited to be starting another quilt with this pattern; it's definitely one of my favorites of all time. 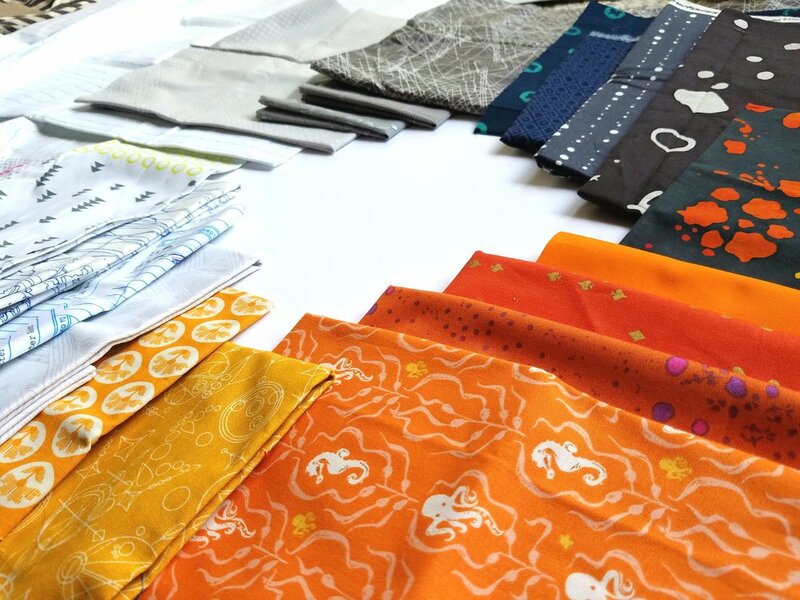 First things first, it's time to choose fabric. I got a lot of inquiries about the acid green that I used for my first version. In case anyone is curious, it is Michael Miller Cotton Couture in Lime. I think the dynamic color played a huge role in the success of this quilt top, so for my second round, I went for an equally intense color: Free Spirit Solid Essentials in Orange. I have no idea what will happen to that fabric down the road, but for now you can still buy more at Crimson Tate! (My kids wanted to buy the whole bolt, but I said no #somuchorange). Ok, so I hate orange. Like, haaaaaate it hate it hate it. But my third son, Gus, looooves orange, and this quilt is for him. So I'll swallow that pill happily. 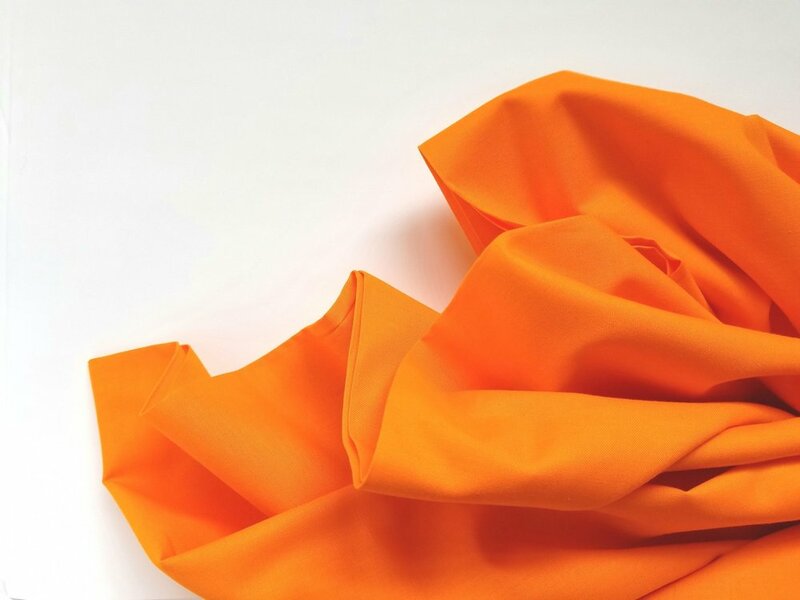 And honestly, I'm still really excited about this orange because of it's vibrancy, so I know it's gonna be awesome like that green! For the green quilt top, I knew I wanted the shoes to gradate/ombre in color (because...that's what I always do, ha!). So my fabric choices were guided by that direction, and I'm leaning that way this time, too. I'll also consider using the same fabrics as part of a background design (more flying geese? something else?) like I did in the first quilt. Or I could make loads of shoes, just like her pattern shoes. I'm still deciding on that one! Select your background fabric: I suggest starting here first, as it's the most prominent fabric in your quilt. In my two versions, the background color is somewhat lighter, but very saturated, and plays a leading part in the quilt. A more subdued fabric will create a less intense quilt when finished. My quilts look most appropriate in fun kids' rooms. For a funky formal living room, try a lovely gray Konan linen for a more sophisticated look. After choosing your background fabric, consider your approach to choosing the rest of your fabrics. You could simply grab scraps as you go, and create each shoe choosing whatever fabrics speak to you. Or you can be more purposeful, choosing a color scheme (and perhaps values) ahead of time. Value: Use light values for the shoe bodies and dark values for the shoe accents. Color: Use blues for the shoe bodies, blacks for the laces, and oranges for all remaining accents. Value: I focused on the overall value for each shoe in my green version. I knew I wanted each shoe to read as an overall value (very light, medium light, medium, and dark), so I chose a fabric that matched this value for the shoe bodies. Color: For a green shoe, you can mix and match values as long as every fabric is green, and so on for an all blue shoe, an all purple shoe, etc. Check out Latifah's pattern for more examples! Starting on page 11, where she goes over layout options, she has digital sketches that are helpful for inspiration. You can see which you are more drawn to, then start choosing your fabrics from there.